It’s not, at first glance, a very ‘chick-lit’ kind of word, is it? In fact, quite the opposite. An adversary is ‘one’s opponent in a contest, conflict, or dispute.’ Yet what would a chick lit novel – or any novel, for that matter – be without someone or something standing squarely in the heroine’s way? A worthy adversary keeps us turning the pages until we (and our main character) reach that all-important, happily-ever-after ending. Who can forget that charming love rat, Daniel Cleaver, who seduces Bridget Jones, whisks her away for a romantic weekend and tosses her blithely aside, only to exchange fists with Mark Darcy to win back her favor? Think of The Devil Wears Prada. What fun would Andy’s year of hell assisting the editor-in-chief of Runway magazine be without Miranda Priestly (not to mention Miranda’s senior assistant, Emily) finding fault with everything she does? Which goes to show that female adversaries – the other woman, the jealous co-worker, the frenemy who wants the hero for herself – can present just as much of a challenge to the heroine’s happiness as any man. They can provide a needed comic touch as well, making us laugh even as we long to see their attempts to thwart our heroine fail. An adversary can be intangible as well – the Endwich Bank, for example, threatening poor overdrawn Shopaholic Becky Bloomwood with a series of letters that escalate in nastiness…coupled with Becky’s relentless pursuit by debt collector Derek Smeath, who’s determined to make her cough up the money she owes for all of those shoes and handbags and exquisite silk scarves she can’t do without. In my Dating/Marrying Mr Darcy series, the adversaries range from a sociopathic co-worker (Prada and Prejudice) to a film star with an over-inflated ego (Manolos in Manhattan)…which just goes to prove that the course of true love never does run smooth. Without a formidable adversary, the happy ending our heroine so determinedly seeks wouldn’t be half as satisfying – or half as much fun – when she finally does find it. So let’s hear it for Daniel and Emily, for terrifying fashion editors like Miranda Priestly, for the ‘other woman’ and the ‘frenemy,’ and for the relentless pursuit of adversaries like Derek Smeath and the Endwich Bank…you (and your ever-escalating roadblocks) keep us happily turning those chicklit pages! GRAND PRIZE – Want to win a Kindle Paperwhite + a $100 Amazon gift card? 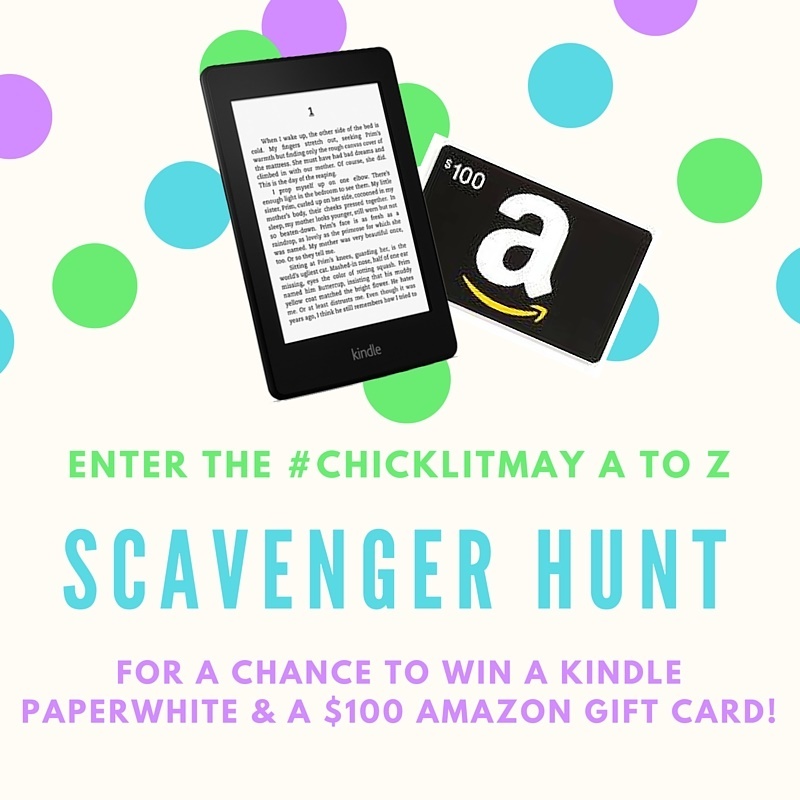 Visit each of the 26 stops on the #ChickLitMay A to Z Scavenger Hunt and collect the alphabet word at each stop (A, B, C, D, etc. ), then submit the A-Z list of words via e-mail with the subject line “A to Z Scavenger Hunt Entry.” Entries will be accepted until Sunday, May 22nd at midnight E.D.T. A winner will be chosen on Monday, May 23rd. Good luck! The next stop on the Scavenger Hunt (the letter ‘B‘) is here. If you’d like to start back at the beginning of the Scavenger Hunt (the letter A), the good news is – you’re already here! This entry was posted in chick lit, ChickLitMay, Giveaway, Katie Oliver, Romance, Romantic Comedy and tagged #ChickLitMay, chick lit, Katie Oliver, Kindle Paperwhite Giveaway, Romance, romantic comedy, Scavenger Hunt on May 15, 2016 by Katieoliver.